Are These Viruses Having An Impact in Your Vineyard? Grapevine leafroll and red blotch disease are two virus-associated diseases that should be on the radar of all grape growers. The following article will hopefully provide you an update on these virus diseases based on our current knowledge. Summer surveying of vineyards for visual leaf symptoms is a great time to assess vineyard blocks for the presence of disease. 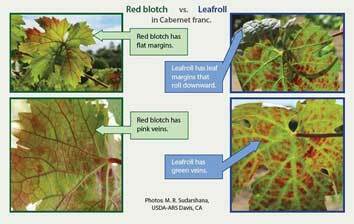 Leafroll is one of the more important virus diseases of grapevines. It occurs in every major grape growing area of the world. There are five grapevine leafroll associated viruses (GLRaVs) that are serologically distinct. These single stranded RNA viruses are placed in a family called Closteroviridae. The majority of these are grouped in the genus Ampelovirus (GLRaV-1, -3, and -4), most of the viruses in this genus have been demonstrated to be vectored by mealybugs and scale insects in vineyards. GLRav-2 is in the genus Closterovirus, and GLRaV-7 is in the genus Velarivirus, there is no known vector of these two genera. These viruses can cause similar symptoms in infected grapevines. All the GLRaVs can be transmitted by vegetative propagation and grafting; GLRaVs in Ampelovirus can also be transmitted by the mealybugs and soft-scale insects in vineyards. GLRaV-3 is the predominant species found in most vineyards worldwide. Recent surveys in the north coast have shown 80% of symptomatic vines sampled were infected with GLRaV-3. To further complicate matters there are variants that have been identified for given GLRaV species. For GLRaV-3 there are several distinct variants known to exist. What needs to be better understood is the significance of these GLRaV-3 variants and their interactions with other viruses when multiple infections exist in a vine. For GLRaV-2 the “Red Globe” variant is known to cause graft incompatibility when grafted onto certain rootstocks (5BB, 5C, 3309C and 1103P) resulting in the decline and death of vines. 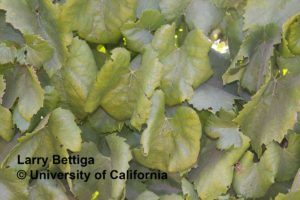 In the post-phylloxera infestation plantings that have occurred in coastal California during the past 20 years there has been an increased incidence of grapevine leafroll disease. The use of non-certified scion material has been a major contributor to this disease increase. 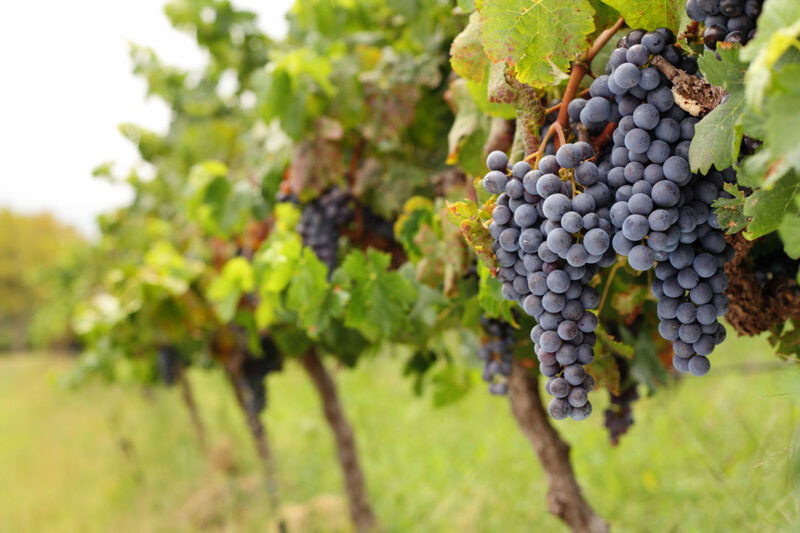 The other issue has been the spread of leafroll (primarily GLRaV-3) from infected vineyards to adjacent vineyards planted with California-certified stock. UC research documented the rapid spread of leafroll into a certified planting from an adjacent infected block. During the 5 years of observation the annual rate of increase in leafroll symptomatic vines was more than 10% in a Napa Valley site. Leaf symptoms become visually apparent by early summer and generally intensify into midsummer and fall. Physical stresses to the vine may increase symptom severity and there are similar symptoms caused by other abiotic and biotic injuries. On affected vines, the margins of the leaf blades roll downward, starting with the basal leaf on the cane. Areas between the major veins turn yellow or red, depending on whether the cultivar produces white or red fruit. In some cultivars, the area adjacent to the major veins remains green until late fall. The most important effect of leafroll disease is a reduction in the yield and quality of fruit from infected vines. Yield losses of 10 to 20% are fairly typical. Because leafroll viruses damage the phloem of infected vines, sugar accumulation is delayed and color pigment production is reduced. Fruit from infected vines can be low in sugar, poorly colored, and late in ripening. It is important to remember that the lack of symptoms in a grapevine does not guarantee freedom from infection by the viruses that are the causal agents of leafroll disease. Leafroll disease on Pinot noir (left) showing burgundy red between green main leaf veins accompanied by downward rolling of the leaf margins; on Chardonnay (right) leaves show a more generalized chlorosis and downward rolling of the leaf margins in late fall. Leafroll viruses may be diagnosed using ELISA and RT-PCR tests. Virus titer levels are variable not only within the year, but also within the vine. Collect petioles in late summer and fall, or shoots/canes for cambium scrapings in fall and winter. PCR and ELISA tests are not available for all GLRaVs. Check with the commercial lab for their preferred sampling method and collection time prior to taking samples. The most common mealybug found in California vineyards is the grape mealybug (Pseudococcus maritimus). Obscure mealybug (P. viburni) is present in central coast vineyards but less common than the grape mealybug. The vine mealybug (Planococcus ficus) was introduced into California in 1994 and has now been found in most production area of the state. Less common is the long-tailed mealybug (P. longispinus) found primarily in the cooler areas of the south central coast. The Gill’s mealybug (Ferrisia gilli) is the fifth species found in California but is currently very limited in distribution with populations found in the Sierra foothills, in the northern coast (Lake County) and in the southern San Joaquin Valley. All the above species are capable of being a vector for leafroll disease. Research has shown that mealybugs can become infective after one hour of feeding on a leafroll virus infected vine and can transmit the virus to a clean host after one hour of feeding. Although all female instars can transmit the virus once infected, the first instar is the most effective vector of the disease. The first instar or “crawler” moves to find a feeding spot and is considered to be the most common dispersal stage of a mealybug population. Wind, equipment, workers and infested nursery stock can also move mealybugs. Plant Material. The first management strategy should be to plant certified vines that have been grown and produced by a nursery participating in the California Grapevine Registration and Certification Program. Once virus infected a vine will remain infected, there is no cure. Commercial nurseries that produce certified grapevines and participate in the California Grapevine R&C Program obtain their clean stock from the Foundation Plant Services at the University of California, Davis. UC Davis has a foundation vineyard for grape cultivars and clones. Before being planted in the foundation vineyard, all vines are tested across biological indicators, and by ELISA and RT-PCR. The foundation vineyard is monitored by visual inspections in spring and fall, and a portion of it is retested every year by ELISA and RT-PCR for viruses known to spread naturally. This provides the highest level of confidence about the virus status of the selections. Both the fruiting scion and the rootstock need to come from certified mother plants. A very common spread of leafroll is the use of infected bud wood from commercial vineyards. The lack of symptoms in the source vineyard cannot be relied upon as a guarantee that there is no virus; many of the major grapevine viruses show no symptoms during some or all of the season. Particularly if wood is collected during the dormant season, it is unlikely that the source vines will show distinct symptoms of virus infection. Selected grapevines should also be pre-tested for virus by a competent diagnostic laboratory if this type of material is going to be used. Even with vine testing, sourcing bud wood from established vineyards carries a risk of introducing virus into a new planting. Learn to recognize leafroll symptoms. Leafroll symptoms become visually apparent by early summer and generally intensify into midsummer and fall as noted above. Symptoms can vary by leafroll species, multiple virus infections, and by cultivar and rootstock combination. Symptoms are generally more apparent in cultivars producing red or black fruit than in white fruiting cultivars. Remember that the lack of symptoms in a grapevine does not guarantee freedom from infection by the viruses that are the causal agents of leafroll disease. Recognize and be aware of potential leafroll vectors. As discussed above mealybugs and scale insects are known vectors of some species of GLRaVs. Monitor and be aware of which insect vectors may be in your vineyards. 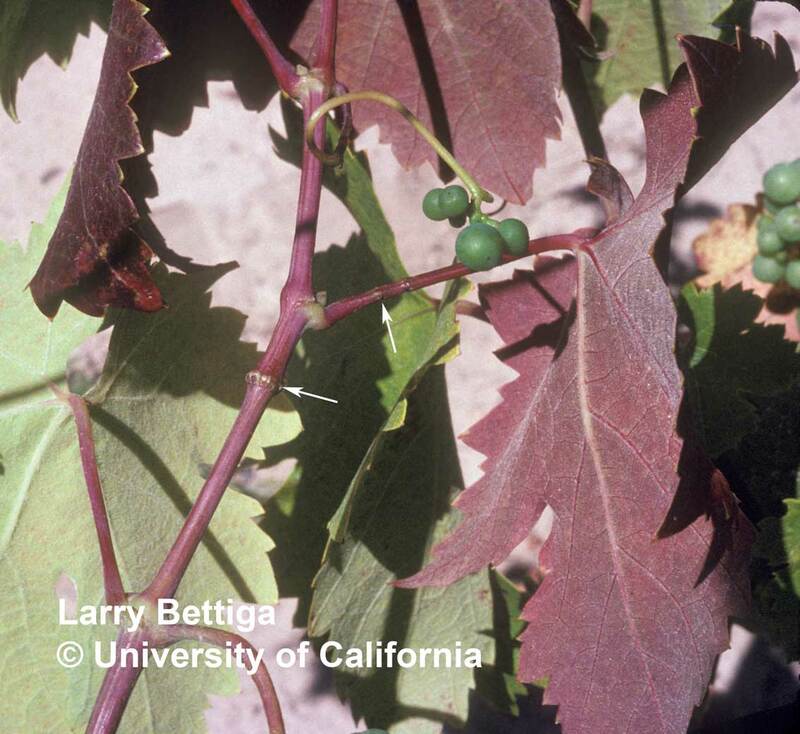 More information on these insects is available in Grape Pest Management UCANR publication 3343 or in the online UC IPM guideline for grapes, http://www.ipm.ucdavis.edu. Know which species of mealybugs are present in your vineyards, their population dynamics are different and will influence the timing of any needed control practices. European fruit lecanium scale (Parthenolecanium corni) is a common insect found in California vineyards, it and other scale insects have been shown to transmit some GLRaV species. Be aware of potential spread from leafroll infected blocks. Leafroll infected blocks can be a source for vector and disease spread into adjacent clean plantings. Consider if plant removal is a viable option to reduce further spread for both the source and clean blocks. Vector control may be a management decision to consider. Recent research suggests the rate of disease spread of GLRaV-3 is greater when higher mealybug population levels are present. Treatment of virus source blocks should minimize the infective vectors leaving the block; the treatment of clean blocks should be targeted to kill infective vectors quickly upon entering the block and to reduce secondary spread to adjacent vines. Area-wide management. When both mealybug populations and the virus causing leafroll disease are present in an area, cooperation between neighboring vineyard owners will be necessary to improve on reducing the spread of disease from infected source blocks to non-infected vineyards. Grapevine leafroll disease is actively being studied both here in the US and internationally. Improvements in identification techniques and better understanding of disease epidemiology in vineyards will hopefully improve our ability to develop management practices to reduce economic impacts. Grapevine red blotch disease was suspected as a concern on vines growing in the Napa Valley in 2008. In 2011 a DNA virus was identified in independent studies in California and New York and shown to be associated with the symptoms on infected vines. 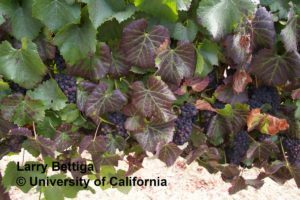 Since the initial identification of Grapevine red blotch-associated virus (GRBaV), it has been found to be widespread in vineyard producing areas of the United States and Canada. A recent survey of a grape herbarium collection at UC Davis has shown one plant specimen collected by Harold Olmo in 1940 from a Sonoma County vineyard to be positive for GRBaV, indicating this virus has been present in California for quite some time. In red wine cultivars, irregular red blotches form on the leaf blades on the basal parts of shoots. Veins on affected leaves can turn pink to red in color. Symptoms can vary between cultivars and the severity may also vary between years. In white cultivars the symptoms are not as dramatic. Interveinal chlorosis is most common followed by irregular chlorotic blotches. These symptoms can begin to appear as early as July and as late as September. In comparing red blotch to leafroll disease, leafroll symptoms are generally more uniform across the leaf blade, the veins remain green, and there can be a downward rolling of the leaf margin. For more pictures of red blotch symptoms on different cultivars go to: http://cesonoma.ucanr.edu/viticulture717/ . Late summer symptoms on Chardonnay, red blotch on the left and leafroll on the right. The identification of GRBaV can be difficult to determine by visual observation due to the similarity of the symptoms to leafroll disease and other nutrient deficiencies. This is especially true in the case of white cultivars. Co-infections with other viruses can also affect symptom expression. Suspected infections should be confirmed by having samples assayed by a PCR test by a commercial diagnostic lab. Check with the commercial lab for their preferred sampling method and collection time prior to taking samples. GRBaV is spread by the propagation of planting stock or grafting non-infected vines using infected budwood. The widespread occurrence of red blotch disease would suggest this type of spread has occurred. Since the identification of the virus and the availability of the PCR testing in 2012, grapevine nurseries have been testing their increase blocks and removing infected vines to eliminate this type of spread. The recently established Russell Ranch Foundation Vineyard at UC Davis has been tested and all vines are free from GRBaV. Each vine planted at the Russell Ranch has undergone extensive virus testing following a process known as Protocol 2010. For nurseries participating in the CDFA R&C Program this will provide a source for future increase blocks to supply certified vines for vineyard plantings. GRBaV is a DNA virus and is closely related to a family of viruses called Geminiviridae. Insect such as leafhoppers and whiteflies can vector other virus diseases within this family. Researchers have been testing potential insect vectors of GRBaV. Although there was a report of Virginia creeper leafhopper being a vector in a greenhouse study other researchers have been unable to duplicate that study. Recently, the three-cornered alfalfa treehopper (Spissistilus festinus) has been shown to be a vector of GRBaV by Brian Bahder, Mysore Sudarshana and Frank Zalom from UC Davis. The three-cornered alfalfa treehopper is an occasional pest of grapevines being observed primarily in coastal and Sierra foothill vineyards. Grapes are not a preferred host of this treehopper which prefers grasses and legumes. On red cultivars when feeding punctures are concentrated around a petiole or shoot they can cause girdling which turns the leaf blades distal to the girdle red. This symptom is less obvious on white cultivars. This may not be the only vector that can spread GRBaV and researchers are continuing research on other potential species. This initial discovery does help to explain the vine to vine spread of red blotch disease reported to have occurred in vineyards. Additional research will be necessary to full understand the impact and potential management strategies to deal with vector spread of red blotch disease. Feeding damage from three-cornered alfalfa treehopper can cause a reddening of shoots and leaves in red cultivars. Arrows point to feeding sites that can result in a girdle. Research has shown that when comparing GRBaV infected vines to ones that have no known GRBaV, leafroll-associated viruses, vitiviruses, or Nepoviruses that Brix were lower and malic acid in the juice were higher at harvest for Cabernet Sauvignon and Chardonnay but not Zinfandel. For Chardonnay, yield was also reduced for infected vines. A study looking at the effect of dropping crop to improve quality on infected vines saw little beneficial effect from that practice. For most cultivars, there is a decrease in total phenols, tannins, and anthocyanins (for red wine cultivars) for vines infected with GRBaV. As with leafroll disease the first management strategy should be to use propagation material that is free from known viruses when establishing new vineyards or grafting existing sites. Meetings of the Grapevine Regulations Working Group have been recently conducted to discuss proposed changes to the Grapevine Registration & Certification Program with regards to red blotch disease. Until budwood increased from the Russell Ranch Foundation vineyard is available for use it is important that propagation material is tested to avoid virus disease. If you have blocks that have leaf symptoms and have had delayed maturity or low crop yield have a virus panel run by a commercial lab to confirm which viruses are present. Remember symptoms are going to be more noticeable in red wine cultivars and less so with white cultivars. For confirmed GRBaV infected vineyards the management response may vary depending on the vine effects that are being observed. The difference in sugar accumulation between infected and non-infected vines in some vineyards has been as much as 5 Brix. In vineyards with a combination of infected and non-infected vines this wide variation in maturity has resulted in selective harvests to improve fruit uniformity. For infected sites that fail to meet yield and quality expectations vineyard removal is the best solution. If only a low percent of vines in a block are infected, then rogueing and replanting is an option. Al Rwahnih, M., et al. 2013. 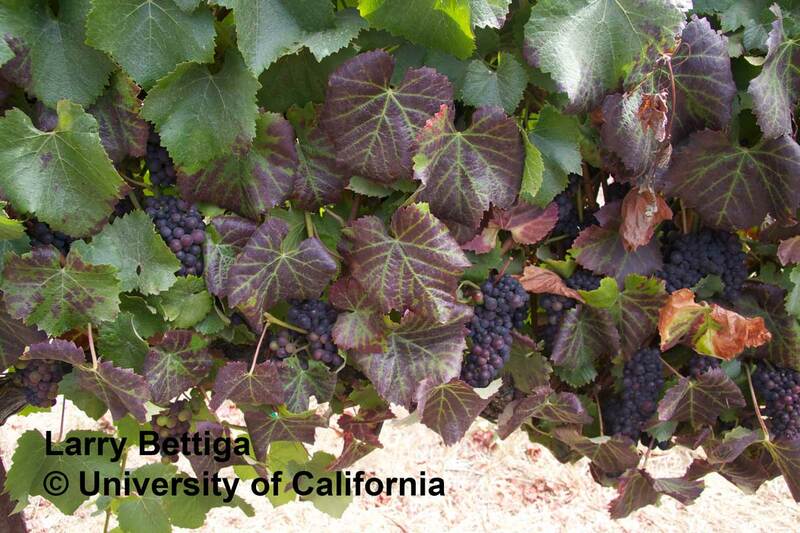 Association of a DNA virus with Grapevines affected by Red Blotch disease in California. Phytopathology 103:1069-1076. Golino, D. A., et al. 2002. Grapevine leafroll disease can be spread by California mealybugs. California Agriculture 56:196-201. Golino, D. A., et al. 1992. Grapevine virus diseases. In: Bettiga, L, (ed. ), Grape Pest Management, 3rd ed. Oakland: University of California Division of Agriculture and Natural Resources, Publication 3343, 157-173. Golino, D. A., et al. 2008. Leafroll disease is spreading rapidly in a Napa Valley vineyard. Calif. Agric. 62:156-160. Krenz, B., Thompson, J., et al. 2012. Complete Genome Sequence of a New Circular DNA Virus from Grapevine. J. Virol. 86:7715. Krenz, B., et al. 2014. Grapevine red blotch-associated virus is widespread in the United States. Phytopathology. First Look. Oberholster, A., et al. 2015. Impact of red blotch disease on grape and wine composition and quality. American Society of Enology and Viticulture National Conference Technical Abstracts, p. 75. (2015). Poojari, S., et al. 2013. A leafhopper transmissible DNA virus with novel evolutionary lineage in the family Geminiviridae implicated in grapevine redleaf disease by nextgeneration sequencing. Plos One 8:e64194. Sharma, A. M. et al. 2011. Occurrence of grapevine leafroll-associated virus complex in Napa Valley. PLoS One 6(10): e26227. Smith, R., et al. 2015. Effect of crop reduction of vines infected with grapevine red blotch-associated virus on fruit maturity. American Society of Enology and Viticulture National Conference Technical Abstracts, p. 136-137. Sudarshana, M. and M. Fuchs. 2015. Grapevine red blotch In: Wilcox, W., et al, (eds. ), Compendium of Grape Diseases, Disorders and Pests, 2nd ed. The American Phytopathological Society.122-123. Tsai, C. W., et al. 2010. Mealybug transmission of grapevine leafroll viruses: Analysis of virus–vector specificity. Phytopathology 100:830-834. JCS Marketing Inc. is a full-service agriculture marketing firm operating in the heart of the San Joaquin Valley. Our goal is to provide resources to growers and ag professionals while supporting the needs of businesses and affiliates that serve the industry. We know ag from the inside out, and our talented team of professionals makes every client a priority. Whether you are launching a fledgling business, want to target a niche market, or have shaped the industry for years, we are prepared to take on the responsibility of representing your brand to the people that matter most.